Hey there! Holidays are in the air and it’s time to look back on what’s been accomplished and celebrate the achievements. Check out all the updates that we’ve recently rolled out. Hooray! We’ve released the Google Australia database. From now on you can discover your competitors’ keywords and ads for paid and organic search in Australia. We’ve got 11 million search queries so far and planning to add even more! Great news for those who have been already using our affiliate program as well as new partners! On top of using PayPal and Webmoney to use your earned funds, now you can transfer the commission right to your SE Ranking account and spend it wisely to boost your rankings. Enjoy! to become an affiliate you need to log into your SE Ranking account (trial or paid one), copy a referral link or banner and start promoting our platform on different forums, blogs, your own site, social networks, etc. we pay 30% commissions for every sale over lifetime including all subsequent account renewals. you can withdraw the commission through Paypal and Webmoney, or simply transfer it to your SE Ranking account. The first parameter, that we’ve added to the Website audit module – the rel=canonical tag. If your website has similar or duplicate content on different pages, the tag rel=canonical will indicate the source page, while the others will be hidden from search engines. This parameter solves the duplicate content issue. 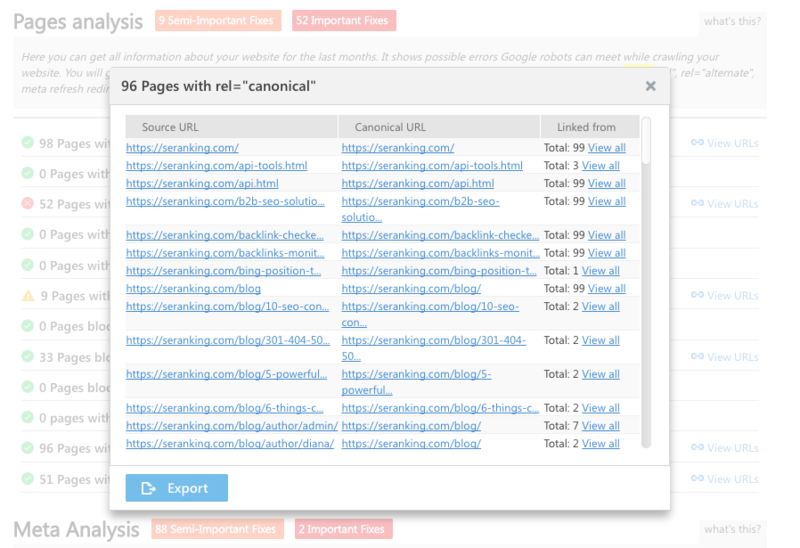 When the Website Audit detects the rel=canonical tag that links to another page of the site, the errors on such pages are not taken into consideration and won’t affect the results of the audits as those will be marked as duplicate pages. You can also view the list of all canonical links. Recently, Google has increased the length of snippets from 160 to 230 characters in the search results. We keep up with the updates – the Website Audit and On-page SEO Audit will notify you if the length of the meta tag does not comply with the latest requirements. Work with backlinks became easier – in two clicks you can transfer all the discovered backlinks from the Backlinks Explorer section directly to the project. We have increased the number of analyzed competitors in the Competitor SEO/PPC research, and now you will get 100 results for each search query. Discover 100 sites that receive organic traffic for keywords similar to yours and 100 sites with similar PPC keywords and audience.